Successful business decisions for asset owners and occupants of underground infrastructure begins with knowing which assets are underground and tracking activities of each. In this four-part series, we are taking a look at pre- and post-inspection manhole and handhole conditions. In our inventories, we have found that asset owners are repeatedly surprised at outcomes of routine joint use inspections. We dig deep to report what inspectors are finding, and the ramifications of conducting an audit routinely, versus not at all. The current problems manhole and handhole owners are facing include, not knowing where specific assets are located, unawareness of trespass, not understanding the condition of vaults’ integrity, and an unfamiliarity of violations by contractors. 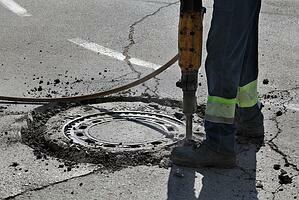 All of these complications add up to affect safety and access in manhole and handhole spaces. Owners who invest in vault audits are consistently finding that damage, violations, and unhealthy water conditions exist underground. Typically, audits are performed twice each decade—if at all—and that’s a lot of time for things to go wrong. Ultimately, these conditions lead to less than stellar customer service, loss of revenue and loss of competitive advantage. A primary reason for owners to inspect manhole and handhole spaces regularly is to locate trespass. The biggest problem with trespass is the domino effect it creates. For example, when trespassers enter vault spaces, they typically come in fast and quick, leaving behind damage, structural harm, and violations. Trespassers are unlikely to follow best practices, especially since the vault space is not their own investment. Trespassers may forego the standard permitting process to rapidly deploy equipment, eliminating costs, allowing them to charge lower initial prices to area residents. Watch the video below for an enlightening example of trespass in manholes and handholes. Properly conducted inspections provide trusted data to asset owners. Conduit inventory services should always deliver accurate information, including asset location, occupant status, and current conditions. Trained inspectors will recognize the facilities of a foreign company with ease. Sometimes asset owners color-code to more easily identify trespass, which helps inspectors in the long run. But even without color-coded cables, inspectors with the proper tools and knowledge can identify unwanted guests. For example, field technicians must follow a step-by-step process to locate trespass, like knowing internal practices of the vault undergoing inventory, thorough research of history and past practices, and a knowledge of permits for legal occupants. Most asset owners who do perform frequent inspections keep accurate records for the future, helping streamline current and future deployment decisions. No matter how the collected data is organized, one thing is true—the only way ensure that vault spaces are trespass-free is through regular inspections by trained professionals. Click here for part 2 on structural damage. In the meantime, share your thoughts on underground conduit in the comments below.